Instand® integrates seamlessly with other Nomadic systems to form distinctive selling environments. 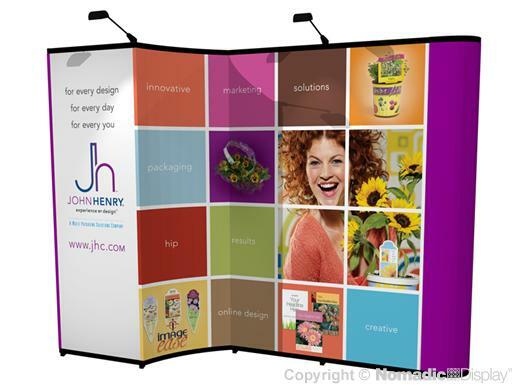 Use Instand as a stand alone trade show display or connect it to other Instand frames, Platinum laminate panels or aluminum extrusions. No other custom portable offers you as much. Instand is known for saving you time and money on storage, transportation, drayage and set-up. Additionally Instand is backed by our industry's best "No Questions Asked" Lifetime Warranty. This design must be used in this configuration to fit in a 10' space. If you want a flat configuration see AB2010N.